International workshop organizers: Trevor Williams (Texas A&M Univ., USA), Rob McKay (Victoria Univ, Wellington, NZ), Karsten Gohl (AWI, Germany), Jim Channell (Univ. of Florida, USA), Laura De Santis (OGS, Trieste, Italy), and Rob Larter (British Antarctic Survey, UK). Parts of the Antarctic ice sheets will melt and raise sea level as climate warms due to increasing atmospheric CO2 concentrations. This knowledge is based on modern observations, computer modeling, and records of past climate, sea level, and Antarctica’s ice dynamics obtained from scientific ocean drilling (DSDP, ODP, and IODP) and other sediment cores. For example, in the Pliocene, ~400 ppm of CO2 and a 2-3°C atmospheric warming resulted in substantial Antarctic ice mass loss, which led to sea level highstands as much as 20m above present. However, there remains significant uncertainty in how much of Antarctica’s ice will melt, which parts of the ice sheet are most vulnerable, and how fast melting will happen. The ice-proximal sediment record of Antarctica’s ice sheet evolution has already revealed a more dynamic ice sheet during past warm periods than previously thought. Antarctic marine sediment holds further records, not yet drilled, of high-CO2 greenhouse scenarios from the last interglacial to the Eocene that can be used as analogs to help predict future ice loss and sea level rise. Several IODP proposals to collect these Antarctic climate records are in the IODP review system (see figure) and more are in preparation. Their summaries can be found on the IODP website. This workshop will focus on synthesizing objectives that will be tested with proposals currently in the system and identify objectives and targets for future proposals, discuss best practices for assessing ice and weather to conduct safe drilling operations in the Antarctic, and introduce scientists (especially those early in their career) to sediment cores from the region. 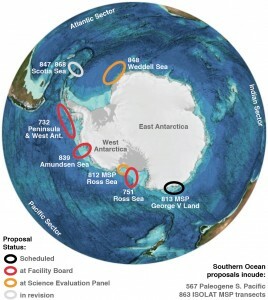 The insights into ice sheet response under warm climates that are gained from drilling in Antarctic and Southern Ocean waters are relevant to the IPCC and climate change policy makers; IODP is uniquely poised to provide this critical information. 1. 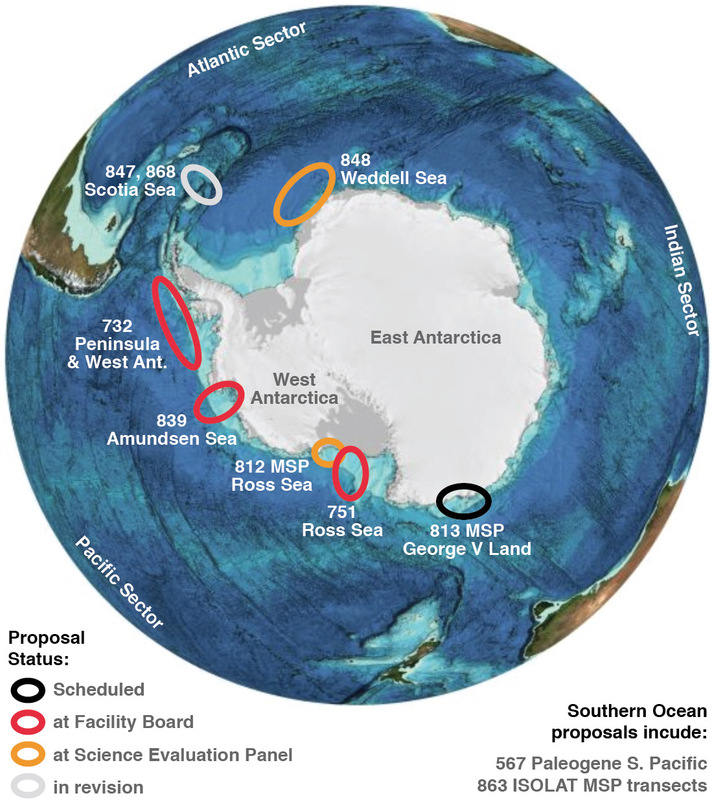 Produce an integrated overview of the science objectives of the drilling proposals currently in the IODP system, with particular focus on what each objective can contribute to understanding Antarctic ice behavior in the past, and future. We will identify sites and age windows that can best provide insight into Antarctica’s past, provide ground-truth for ice sheet modeling work, and create a roadmap for new drilling proposals. 2. Examine classic Antarctic sediment cores housed in the IODP Gulf Core Repository that illuminate Antarctica’s past environments and marine glaciological history. This will provide an opportunity for seasoned Antarctic scientists to share experience and knowledge with the next generation of Antarctic scientists. 3. Establish how best to use satellite images and weather data to assess sea ice, iceberg, and weather hazards for expedition planning and for at-sea decision making. We will also discuss possible collaborations with national and international facilities to support IODP operations in Antarctic waters.